Admiral Swansea Bay 10K and Mascot Race 2017! 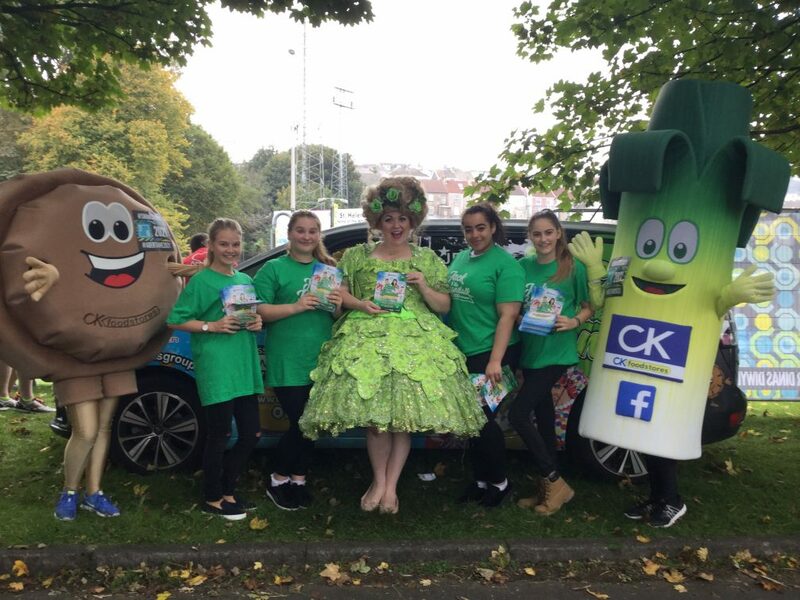 After visiting Carmarthen, Llanelli and Swansea’s Limitless Trampoline Park last weekend for a day full of panto shenanigans, the Green Bean Fairy Queen once again donned her big dress and big hair to support those participating in the Admiral Swansea Bay 10k Race…and before you ask; no, I did not run!! 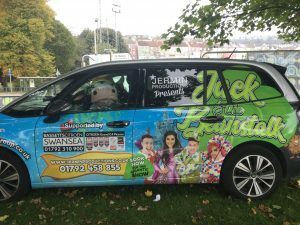 The day began with an early start, getting glammed up and parking our fabulous Bassetts Citroen pantomime car into position along the bay front. Once into costume, it was time to crack out the bacon rolls, coffee, panto flyers and support for the amazing runners for the day! Our fantastic dancers were out in full force sporting their Peter Lynn and Partners T-Shirts which certainly made everyone Beanstalk GREEN with envy! We even had some runners asking if they could purchase them and join this year’s cast!! Now wouldn’t that be fun! The programme of events started off with the junior races, with some fantastic young runners taking part in the 1k, 3k and 5k races – I was lucky enough to get the chance to speak to a lot of these aspiring athletes and I was horrified to see that not one of them had even broken a sweat (I can’t run 100 metres – let alone a thousand!). It was amazing to talk to so many inspirational young people who kicked off the day with such high spirits! The race was simple. A hundred metre stretch was all it took. With Cyril the Swan, a man riding a unicorn, a Go-Ape gorilla and many others amongst the competition, we knew Popty and Mr. Leek had some serious work to do. The horn blew, and the cheers erupted! The race was over in (nearly) a flash, and whilst our two mascots didn’t win, they certainly made a valiant effort! Popty managed to run 50m of the race with his shorts around his ankles which had the crowds roaring with laughter. 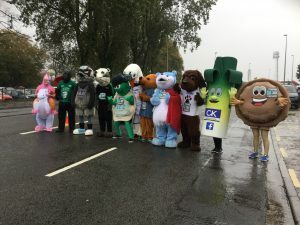 The team spirit was so lovely to be a part of, with all the mascots coming together for a final photograph to commemorate the occasion! As the rain continued to pour, the morale of the day never wavered once! After just half an hour, runners were crossing the finishing line to huge cheers, goodie bags, family hugs and well deserved cheeseburgers! The event – the 37th race since it started in 1981 – was, once again, a huge success, and we were all chuffed to be a part of such a wonderful day. 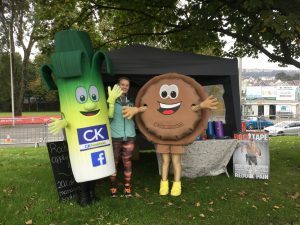 Huge thanks go to one of our headline sponsors, Admiral, for letting us show our support for this event, and to Popty, Mr. Leek and CK Foodstores for being such fantastic sports! Thats all from me for now!